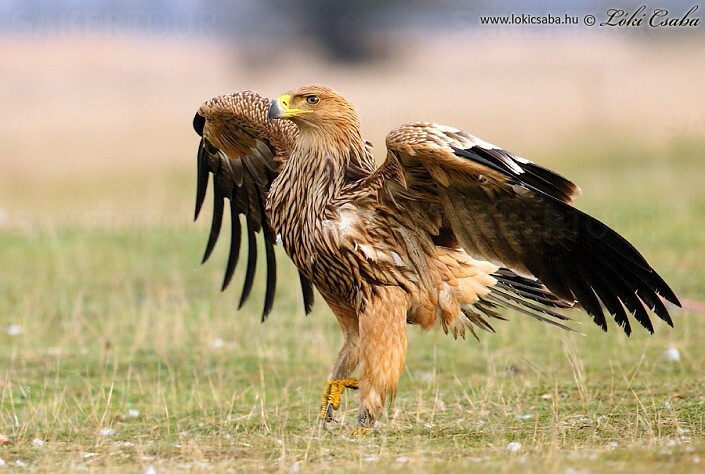 Today I want to write about a really cool, strong species of eagle, the eastern imperial eagle. These beautiful birds grow to about 90 cm long and have a wingspan of over 2 metres, making them the second largest eagle found in Europe. They use their powerful talons and sharp beaks to catch ground squirrels, hares, hamsters, birds and reptiles. They also eat carrion and steal food from smaller birds of prey. Eastern imperial eagles mate for life, building large nests at the top of tall trees. They lay 2-3 eggs, but often the oldest chick will kill the younger chicks so that there is less competition for food. The chicks are able to fly after about 10 weeks, but still rely on their mum for food for a few more weeks. Whilst most eagles prefer to live in high mountains, these guys prefer lower forests, open woodland and agricultural areas. Eastern imperial eagles breed in south-eastern Europe and western Asia and migrate to the Middle East, east Africa and southern Asia during the winter months, sometimes flying up to 8,000 km in a few weeks. They are considered vulnerable to extinction due to habitat loss, hunting, loss of prey and collisions with power lines. Are there any other interesting facts that you would like to share about eastern imperial eagles? This was a very interesting post! !